Dena Griffiths – Hello, I’m Dena. I’ve been in the industry for 24 years. My most memorable moment was experiencing the Thanda Tented Safari and the many game drives in South Africa. Another highlight was attending Reggae Sumfest on the beach in Montego Bay, Jamaica. Linda Stanley – Hello, I’m Linda. I’ve been working in travel accounts for 4 years now. My most memorable moment was in Botswana when I saw a leopard for the first time in real life. Then to see it devour its prey for 2 hours was just amazing. Another memorable moment was standing in Times Square, New York City, it was just alive with lights and people. Sally Cochrane – Hello, I’m Sally. I’ve been planning travel itineraries for 3 years. My most memorable experiences include: skiing on Christmas day in Austria with my Italian host family, going on an army tank ride through the mud in Slovakia and waking up to see the sun rise over Angkor Wat, Cambodia. Laurice Burke – Hello, I am Laurice. 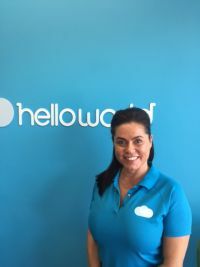 I have been the owner of helloworld Albany Creek for 21 years and in the travel industry for over 27 years. Over this time I have been involved in many local fundraising events and sent many local families and school groups on some amazing memorable holidays! Two of my most memorable travel experience are taking a helicopter journey and landing on a glacier in Skagway, Alaska and experiencing Victoria Falls by taking a trip to Devils Falls from Livingstone Island at the very top of the falls where the view from the rock pool was incredible! Natasha Orpwood – Hello, I’m Natasha. I have been planning travel itineraries for 11 years. My most memorable travel moment was experiencing Disneyland with my family and seeing the joy on my children’s faces. My favourite destinations are San Francisco and London. O'ngelique King - Hello, I’m O’ngelique! I have been in the travel industry for over 7 years planning holidays for my clients in the local Albany Creek area. My most memorable experience was travelling to the Maldives on my honeymoon and staying in an overwater bungalow relaxing and taking in the million shades of blue. I look forward to helping you plan your next dream holiday!